We’ve compiled the most frequently asked questions and their answers by NuStep machine model. If you still have a question, please contact us. WHAT IS FULL SERVICE DELIVERY? Full Service delivery includes freight transportation to your address and placement inside your home. The delivery company will contact you prior to the delivery to schedule a date and time (4 hour window) for your delivery. The delivery personnel place your NuStep in your chosen location within your home*. They will also take the product packaging material away from your home. NOTE: Prior to delivery, please ensure there is a clear path to the location you want your NuStep cross trainer placed. Delivery personnel will not move furniture. *If you order a T5, T5XR, or T5XRW and the unit will be placed in a location that requires delivery personnel to take it up or down a flight of stairs and/or move it around a tight corner, please notify your Active Living Consultant at 1-800-322-2209 at the time of purchase. These units are packaged differently (in two pieces) and require some assembly. Additional charges may apply. WILL THE DELIVERY PERSONNEL SHOW ME HOW TO USE THE NUSTEP? No, the delivery personnel do not show you how to use the NuStep. They are contracted for deliveries only. Dock-to-dock delivery includes freight transportation to your address and delivery to your driveway or curb. A delivery appointment day and time is not offered with dock-to-dock delivery services. You are responsible for moving the NuStep(s) from the delivery point to the desired location. You are also responsible for disposing of all the packaging material. NOTE: Dock-to-Dock delivery is recommended for professional settings only, where personnel are available to lift heavy equipment. Depending on the model ordered, a NuStep cross trainer weighs between 210 to 315 lbs once it is out of the box. How do I get help if my NuStep machine is not working properly? What cleaning products should I use to clean my NuStep machine? The unit may be cleaned with any mild, non-toxic, and non-abrasive cleaner. Organic cleaners are recommended. Use cleaning products as specified by the applicable manufacturer. Note: Bleach and alcohol based cleaners may discolor NuStep products. How do I switch between pounds and kilograms on the display? Press RESET and the down arrow at the same time to toggle between pounds to kilograms. How does the T4 / TRS 4000 monitor heart rate? The T4 uses Polar heart rate technology and the user must be wearing a chest strap. Call 800.322.4434 to purchase a Polar transmitter belt. What is the weight limit on the T4 / TRS 4000? The weight limit for the T4 is 400 pounds. How do I view the cumulative steps on the display? To display the cumulative steps for the NuStep, press Reset and the up arrow at the same time. You cannot reset this displayed value. Read all 9 digits across 3 windows. The value is displayed for 5 seconds. Where is the serial number located on my T4 / TRS 4000? The serial number label is located just behind the display, on the right side of the curved rectangular tube. Do any T4 / TRS 4000 parts contain latex? How many steps are equivalent to one mile? How do I fix a display that is blank, or shows all 888s? Replace the four double-A batteries found in the battery compartment on the back side of the display. It is important that the batteries are fresh and have not weakened since manufacturer date. Many of our customers have found success by purchasing a new set of batteries from a high-volume retail store. Note: Bleach and alcohol-based cleaners may discolor NuStep products. Press the WEIGHT + or WEIGHT – button. The currently configured weight will be displayed along with either an “LB” or “KG” icon. Simultaneously press the WEIGHT + and WEIGHT – buttons to switch between English and metric units of measure. How does the T4r monitor heart rate? The T4r uses Polar heart rate technology and the user must be wearing a chest strap. Call 800.322.4434 to purchase a Polar transmitter belt. What is the weight limit on the T4r? The weight limit for the T4r is 400 pounds. Where is the serial number located on my T4r? The serial number is located on the rear support tube of the main frame. Do any T4r parts contain latex? How does the Pace Partner program work? Press the PACE PARTNER button to begin program set up. The default pace partner pace will appear in the SPM display. To increase or decrease the default SPM pace, press the pace partner – or + buttons until the desired pace displays in the console window then press the SELECT button to complete the program set up. Start stepping and increase your stepping speed so you are able to keep up with your pace partner. 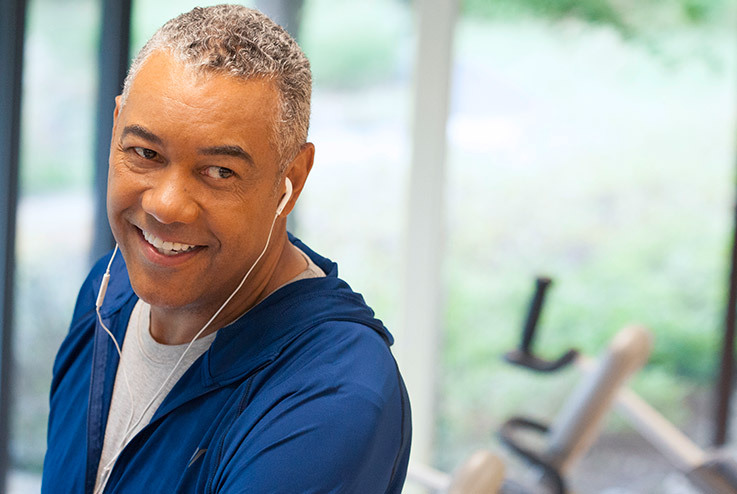 During your workout, you may increase or decrease the selected pace by using the – or + buttons. How do you power the T4r? The T4r is powered with 4 AA alkaline batteries or 4 NiHM rechargeable batteries may be used. The NuStep battery access cover is located on the backside of the console. A coin may be used to remove the cover- see user manual for instructions. The T4r does not have a AC adapter. How does the T5 monitor heart rate? 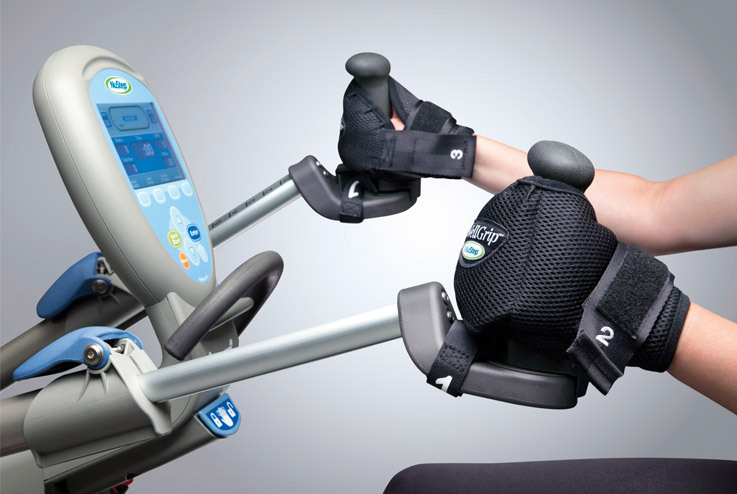 The T5 models can monitor heart rate by placing both hands on the contact heart rate grips located just below the arm rests and beside the seat cushion. A coded Polar belt can also be worn while exercising on the T5 models. Call 800.322.4434 to purchase a Polar transmitter belt. My Polar heart rate belt from my T4 does not work with my T5. What’s wrong? The T5 models use a “coded” Polar belt. “Un-coded” Polar belts used with the T4 (TRS 4000) are not compatible with the T5. “Coded” T5 Polar belts, however, will function with the TRS4000. What is the weight limit on the T5? The weight limit for the T5 model is 500 pounds. Where does the AC adapter plug into my T5? The AC adapter plugs in at the front of the unit, near the floor. The display on my T5 says “Low Battery.” What should I do? Plug the T5 into the AC adapter in order to let the battery charge. Click here for instructions. Using a faster stepping speed will also charge the battery on the T5. The display on my T5 will not turn on. What should I do? The T5 may be in “Battery-Saver” mode. This will occur if the unit has not been used in a 1 week time period. Simply pedal as quickly as possible to wake up the T5. The battery may be dead on your T5. Plug the AC adapter into your T5. Click here for instructions. If it still does not turn on, please call customer support at 800.322.4434. How do I view the cumulative steps on my T5? After pressing the Quick Start button, press the “Swap Display” button and the “Enter” button at the same time. A screen will appear showing total steps. Where is the serial number located on my T5? From the main screen, press the “Info Menu” button and scroll down to the “Contact and Product” section. Press enter and the serial number will be displayed on the right hand side of the display. The serial number is also located at the rear of the unit near the floor, just below the seat rail. Do any T5 parts contain latex? How does the T5XR / T5XRW monitor heart rate? 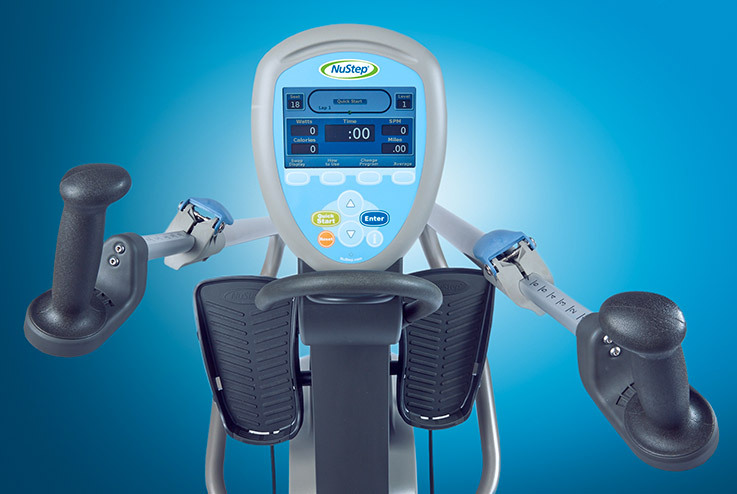 The T5XR / T5XRW models can monitor heart rate by placing both hands on the contact heart rate grips located just below the arm rests and beside the seat cushion. A coded Polar belt can also be worn while exercising on the T5XR / T5XRW models. Call 800.322.4434 to purchase a Polar transmitter belt. My Polar heart rate belt from my T4 does not work with my T5XR / T5XRW. What’s wrong? The T5XR / T5XRW models use a “coded” Polar belt. “Un-coded” Polar belts used with the T4 (TRS 4000) are not compatible with the T5XR / T5XRW. “Coded” T5XR / T5XRW Polar belts, however, will function with the TRS4000. What is the weight limit on the T5XR / T5XRW? The weight limit for the T5XR / T5XRW model is 600 pounds. Where does the AC adapter plug into my T5XR / T5XRW? The AC adapter plugs in at the very front of the unit, right near the floor. It may be easier to see the plug using a flashlight. Click here for instructions. If your wall plug is behind the unit, the adapter cord can be run down the very center of the unit. Be sure that the T5XR / T5XRW is not sitting on the cord. The display on my T5XR / T5XRW says “Low Battery.” What should I do? Plug the T5XR / T5XRW into the AC adapter in order to let the battery charge. Click here for instructions. Using a faster stepping speed will also charge the battery on the T5XR / T5XRW. The display on my T5XR / T5XRW will not turn on. What should I do? The T5XR / T5XRW may be in “Battery-Saver” mode. This will occur if the unit has not been used in a 1 week time period. Simply pedal as quickly as possible to wake up the T5XR / T5XRW. The battery may be dead on your T5XR / T5XRW. Plug the AC adapter into your T5XR / T5XRW. Click here for instructions. If it still does not turn on, please call customer support at 800.322.4434. How do I view the cumulative steps on my T5XR / T5XRW? Where is the serial number located on my T5XR / T5XRW? Do any T5XR / T5XRW parts contain latex?